It was her wonderful range of visual compositions, whether it was illustration or lettering—both channeling the characteristics of folk art, that piqued my interest about Shelby Rodeffer, a painter and commercial artist. 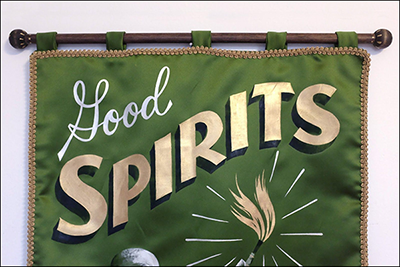 Here, she shares her story about entering the world of sign painting and committing herself to generating more creative forms, including handmade banners. Drawn to your tall skills at sign painting. How did you arrive at adopting and practicing traditional sign painting? Was there an initial encounter of work, related to sign painting, that played a role in what you do for a living? I grew up in a small town just north of Nashville, Tennessee, with one traffic light. All of the signs were hand-painted, so sign painting was something that I always had exposure to. I didn’t consider it as a career until I was working at a letterpress shop and thinking of my next steps. To work for yourself in letterpress, you need to be able to afford expensive and rare equipment and also a space to store it all, which wasn’t in the cards for me as a recent college graduate. I had always had an interest in sign painting and it was at this time that the book and documentary by Faythe Levine and Sam Macon was getting attention. I decided to spend the next few years learning as much as I could about the trade in hopes that I could make a living painting signs. A common desire and questions is: How to start? How did you start? → What was the first thing you did? What were essential activities taken to start and establish your career, and why were these steps important? I started out watching videos on YouTube of different sign painters. The videos helped me to learn how you hold a brush and form letters, but they didn’t cover more technical aspects like surface prep, paint consistency, layout, etc. So I was sort of blindly moving forward with my limited knowledge, and I got a few jobs painting for friends and friends-of-friends. The “Intro to Sign Painting” workshop at New Bohemia Signs in San Francisco was a really great experience for me, and it also showed me that it wasn’t possible to learn everything you need to know about sign painting in a weekend (there are only so many hours in a day to grill your teacher with questions). 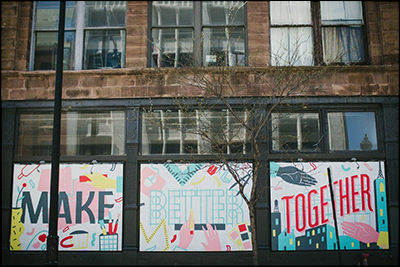 At this point, I decided if I wanted to be serious about sign painting, I would need to go somewhere with more opportunities to learn from seasoned sign painters, so my partner and I moved to Chicago. From there, I started attending regional events and traveling to national and international sign painting meetups. I’ve had many teachers and mentors in the past six years, and each of them have given me different nuggets of knowledge. Some of them learned from traditional sign painting schools, others learned as apprentices, and some were self-taught. I’ve paid for workshops from some of them, and then there are the occasions when you run into someone painting a sign on the street and you politely ask them for their contact info so you can bug them later. Sign painting is growing as a cultural phenomenon. What are your takes on why this is happening? When the industry began to die out in the mid 1980s (due to the advent of the vinyl plotter and digital illustration software), a lot of sign painters became vinyl installers or started new careers. This was pre-social media, so a lot of folks weren’t aware that there were other sign painters out there who were still meeting up and still working in the field. I think the documentary “Sign Painters” brought a lot of veteran sign painters out of retirement. It also shined a light on the current sign painting renaissance with younger people taking up brushes for the first time, which was a major influence on me and my career path. In addition to sign painting, you also engage other mediums, like your kickass banners. How do you embrace other types of creative mediums? How do you keeping honing your sensibilities/skills in each one? Do you set aside alone time for personal art-making? I’m an artist first and a sign painter second, so it’s important for me to keep up a personal art practice. As I’ve learned more about sign painting and the different avenues of lettering art, my work has been influenced more and more. I am a big advocate for keeping sketchbooks. They are very low-pressure and you can experiment with different styles without having to think about a cohesive body of work. When I work on larger art pieces, I tend to sketch every piece in the series at once, so that even if I work on the individual pieces intermittently, they will all hopefully share some of the same sensibilities from the initial sketches. The banners are extremely strenuous since I fabricate them completely by hand. I sew, paint and assemble each one from scratch and they take about 3 weeks to make, but they are always worth it. One of the themes of your recent work is femininity. When I use femininity as a theme, I am referring to the gender concept of female. Simply, I am using feminine forms and structural elements (windows, walls, stairs) to express how I feel that femme-presenting people are sequestered into socially-acceptable boxes in society. I think the recent year has brought conversations about sexism, gender-based violence and gender-based discrimination to light for the general public, which is great, but we have a long way to go before many femme-presenting people can feel safe and valued. the ones you love using? Grid paper is my most-used thing, that and a level. I’ve been learning how to use the iPad Pro which has been really helpful for sending quick sketches and exploring color variations. Helping other people maintain and boost their small businesses is very rewarding and keeps the job satisfying, even if I’m just reproducing a font or existing logo. 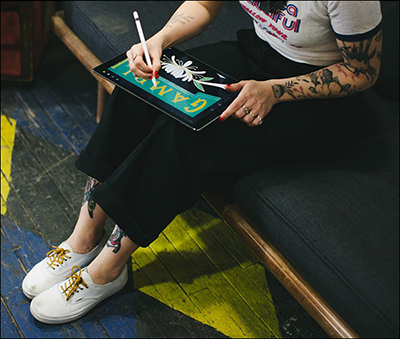 The jobs, where I get to start with a blank slate and build a visual identity with my customers, are amazing because they check all of the boxes: I get to help them, and I get paid AND I am creating my own original artwork. For everything else, I try to show my personal artwork as frequently as I can so that I don’t get bummed out with less creative jobs. What is your definition of growth, as it relates to work/business? The growth that I am experiencing now is getting to be more selective. For the past 6 years, I’ve taken on every illustration, design or painting job that’s come my way. Due to word-of-mouth and exposure that I am grateful for, I can’t physically do all of the work that is coming my way anymore. I still get a little FOMO when I have to pass something up, but it feels much better than refreshing my email every ten minutes hoping for work to come through. What tools do you use and recommend to work: for collaborating, getting things done and running your practice? I’m pretty basic I think. I use Google Calendar to keep myself on track. Trying to remember everything I need to do in a day makes me feel like my brain is a web browser with too many tabs open. Some days, I schedule my lunch breaks and when to walk down the street to buy cat litter, and other days it’s much more open. I’ve been using Quickbooks Self-Employed over the past year and it has definitely helped me stay on top of invoicing and expenses. How do you get the word out about you do? How do you attract customers/projects? I operate through word-of-mouth referrals mainly, although I’m on Instagram and have a website for my business as well. Word-of-mouth has been really great, because it tends to mean that I am talking to more people who are sure they want to work with me and less bidding is involved. However, there have definitely been some months where I was peeking into any storefront that appeared to be in-construction and giving my business cards out. as an artist. How do I become one?”, what’s your response? It’s great to have a mentor or group of friends to check in with, even if they aren’t doing exactly what you’re doing. If you can find someone who is doing what you want to do, scroll way back in their timeline to see what they were doing two or three years ago. You’ll see that it doesn’t happen overnight. How does the city of Chicago, Illinois, contribute to your work? And what makes it special for startups/business/creative community? 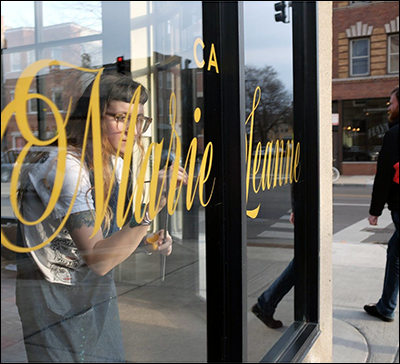 Chicago has a lot of sign painting history and a really vibrant and diverse art scene. There is no shortage of inspiration here if you just look around! All images courtesy of Shelby Rodeffer. 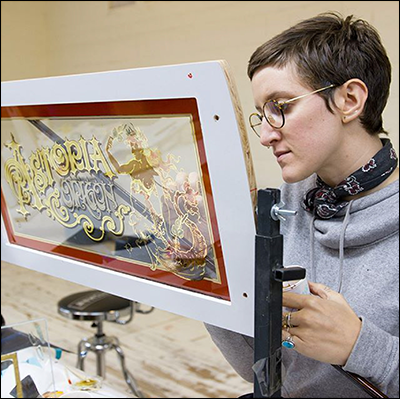 Read my Makers series interview with Faythe Levine and Sam Macon, the filmmakers of the documentary “Sign Painters” (2014).